Camera Work was bound with a handsome green/grey cover designed by Edward Steichen. The back cover was most often an advertisement for Eastman Kodak. The magazine was a relatively expensive publication primarily because of the excellence Stieglitz insisted on for the reproduction of photographs. Photographs were printed on photogravure plates made from the original negative. Often they were printed on Japanese tissue and individually placed on colored mounts. It is believed that many of Stieglitz’s reproductions were of better quality than the original photographs. Nendeln/Liechtenstein : Kraus Reprint, 1969. After Alfred Stieglitz founded the Photo-Secession in 1902, he created the elite and avant-garde photographic journal, Camera Work. In creating Camera Work, Stieglitz wanted to construct the “finest, most serious, most beautifully produced photographic periodical” in existence, an endeavor in which most critics agreed he succeeded (Bochner 35). 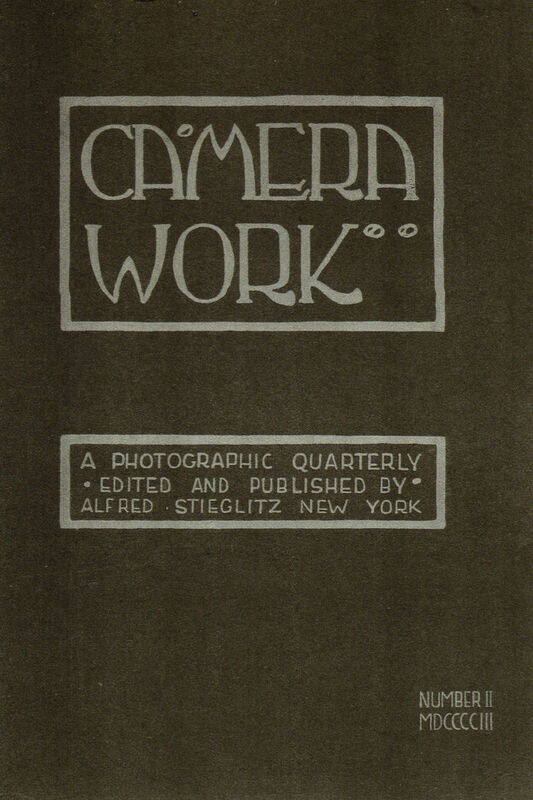 Although his publication was dedicated to propagating the principles of the Photo-Secession movement, in the first issue of the magazine Stieglitz asserted that Camera Work “owes allegiance to no organization or clique, and though it is the mouthpiece of the Photo-secession that fact will not be allowed to hamper its independence to the slightest degree” (15). Despite this assertion, Stieglitz did not do much to diversify the contents of his magazine, and most of its contents were from a select group of regular contributors and members of the Photo-Secession movement. In fact, of the 473 photographs published in Camera Work, 357 were the work of fourteen photographers, including Stieglitz himself. The remaining 116 photographs were the work of 39 photographers (Whelan 192). According to Stieglitz, the main goal of the magazine was to publish the photographs that were the best examples in the field and to publicize photography as an art form. Each issue included photographs from about three photographers printed on high-quality paper, and around ten articles including opinion pieces, exhibition reviews, and essays on photographic aesthetic. Throughout the fourteen years of the quarterly journal’s publication, fifty issues were produced and 473 photographs were published. During the magazine’s entire run from 1903 to 1917, Stieglitz served as editor in chief, publisher, and was also one of the magazine’s major contributors. “The time appearing ripe for the publication of an independent American photographic magazine devoted largely to the interests of pictorial photography, ‘Camera Work’ makes its appearance as the logical outcome of the evolution of the photographic art. Alfred Stieglitz was born in on January 1, 1864 in Hoboken New Jersey, to a German-Jewish family. A major figure of the Modernist period, Stieglitz was both an artist and a revolutionary who devoted himself to promoting photography as a major form of artistic expression. After studying in Europe, Stieglitz returned to New York in the 1890s and was profoundly discouraged by the progress of American photography. In 1897 Stieglitz published Camera Notes after co-founding the New York Camera Club, but in 1902 it ceased publication. In 1902, Stieglitz founded and became the director of the Photo-Secession, a movement devoted to photography as an art form and a secession from the opinion of the masses. Stieglitz founded Camera Work in 1903, a publication based off of the ideals of the Photo-Secession and designed to showcase the best examples of American and European pictorial photography. The other major component of the Photo-Secession was Stieglitz’s gallery, 291, located at 291 5th Avenue. Stieglitz served as the editor and publisher of Camera Work until 1917. In 1924, he married the artist Georgia O’Keefe, and continued to promote photography until his death in 1946. Bochner, Jay. An American Lens: Scenes from Alfred Stieglitz’s New York Secession. Cambridge: MIT Press, 2005. Green, Jonathan. Camera Work: A Critical Anthology. Millerton: Aperture, Inc., 1973. Hoffman, Frederick J., Charles Allan, and Carolyn F. Ulrich. The Little Magazine: A History and a Bibliography. 2nd ed. Princeton: Princeton UP, 1947. Mancini, J.M. Pre-Modernism: Art-World Change and American Culture from the Civil War to the Armory Show Princeton: Princeton UP, 2005. Scholes, Robert and Sean Latham. “Modernist Journals Project.” (n.d.): MLA International Bibliography. EBSCO. Web. 13 Sept. 2010. Richter, Peter-Cornell. Georgia O’Keefe and Alfred Stieglitz. Munich: Prestel, 2001. Stieglitz, Alfred. Camera Work: A Pictorial Guide. Ed. Marianne Fulton Margolis. New York: Dover Publications, Inc., 1978. Stieglitz, Alfred. “An Apology.” Camera Work. No. 1. July 1903. “Stieglitz, Alfred.” Dictionary of Modern American Philosophers. London: Continuum, 2005. Credo Reference. Web. 19 September 2010. Whelan, Richard. Alfred Stieglitz. Boston/New York: Little, Brown, and Company, 1995.